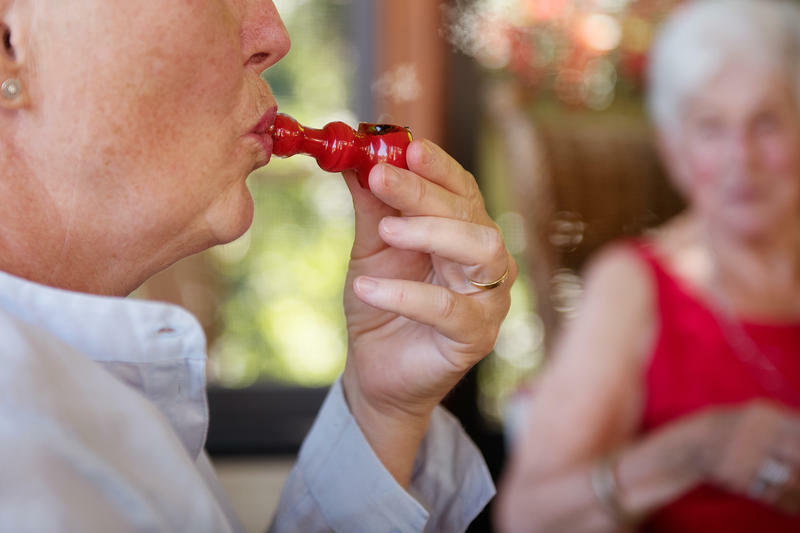 As more states legalize marijuana for medical and recreational use, seniors are trying it, seeking alternative painkillers. One local dispensary in Orange County, Calif., provides seniors with a free shuttle to and from the store. Stephanie O'Neill reports. 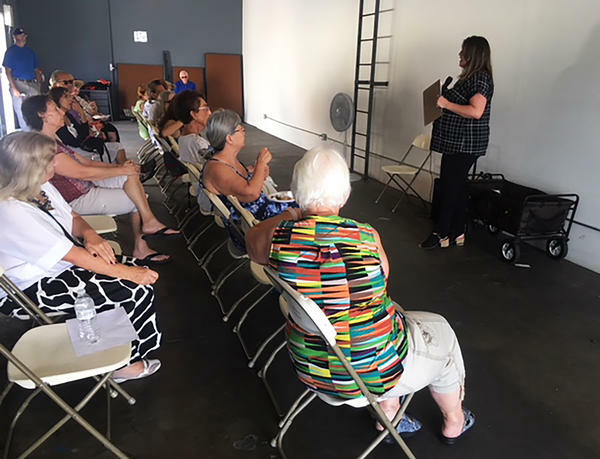 STEPHANIE O'NEILL, BYLINE: Each month, a Greyhound-sized bus pulls up to the Laguna Woods Village retirement community here in Orange County and loads up customers. Among them, 90-year-old Shirley Avedon. She's never been a cannabis user, but painful carpal tunnel syndrome in both hands and an aversion to conventional steroid and surgical treatments prompted her to climb on board. Avalon's a former manager of an oncology office, and she's hoping to get the same relief that her cancer patients got when they used marijuana. SHIRLEY AVEDON: It was fantastic what it did for them. And in that time, it wasn't legal. So they used to get it off their children. (Laughter). O'NEILL: After about a 30-minute ride, the bus pulls up to Bud and Bloom, a licensed cannabis dispensary in Santa Ana. Kandice Hawes is its director of community outreach. KANDICE HAWES: All right, everybody. As soon as we get there, we're going to go straight into the event space, where we're going to have some sandwiches for you guys. O'NEILL: Hawes says about half the seniors on board today are cannabis newbies. They've never tried it before. HAWES: Not everybody is coming to be a customer. A lot of people are just coming to be educated. O'NEILL: Seventy-two-year-old Layla Sabet is a first-timer seeking relief from back pain that she says keeps her awake at night. LAYLA SABET: I'm taking so much medication to sleep, and still I can't sleep. So I'm trying it for the back pain and the sleep. O'NEILL: Hawes and several vendors take turns speaking to the group and answering questions. 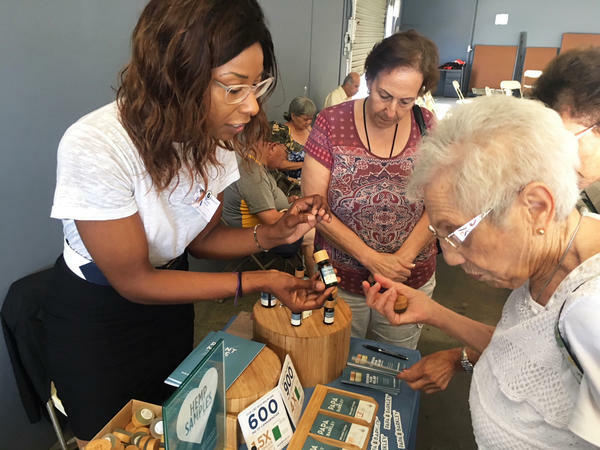 Then they invite the seniors into the dispensary, where they can buy everything from old-school rolled joints, to high-tech vaporizer pens, tinctures, creams and edibles. Seventy-five-year-old Jim Lebowitz is a return customer who suffers pain from back surgery. What did you end up getting today? Anything? JIM LEBOWITZ: Yes. I got the edibles, this combination of CBD and THC. O'NEILL: And which kind of edibles did you get? LEBOWITZ: I got chocolate, and I got gummies. I've never had the chocolate before, but I've had the gummies and they work pretty good. O'NEILL: Gummies are cannabis-infused candies. The CBD and THC he refers to are compounds known as cannabinoids. CBD doesn't get you high. THC does. Derek Tauchman works behind the counter at Bud and Bloom. He says fear of getting high is the biggest concern expressed by senior consumers, who he says make up the bulk of new business. 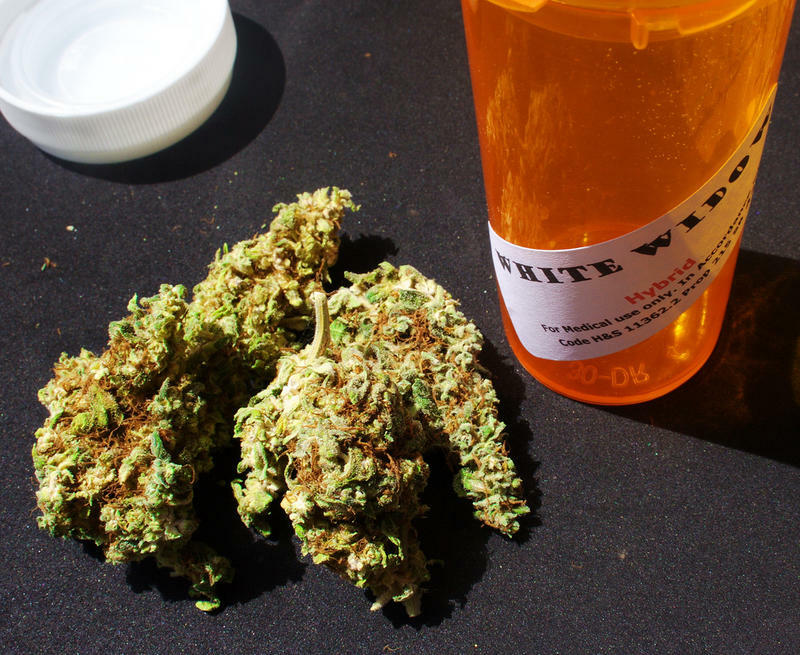 DEREK TAUCHMAN: What they don't realize is that there's so many different ways to medicate now that you don't have to actually get high to relieve all your aches and pains. O'NEILL: Despite all the enthusiasm, marijuana isn't well-researched, says UCLA gerontologist Dr. David Reuben. It remains a Schedule 1 substance, meaning it's illegal under federal law. And that makes it harder to study. Still, Reuben says, a growing number of his patients are interested in using it for things like anxiety, chronic pain and depression. DAVID REUBEN: I'm, in general, fairly supportive of this because these are conditions that there aren't good alternatives. O'NEILL: But Reuben cautions his patients that products bought at marijuana dispensaries are not FDA regulated like prescription drugs. That means dose and consistency can vary. Still, he says, if it gets patients off toxic or addictive prescription drugs like opioids, all the better. Seventy-one-year-old cannabis customer Jim Levy suffers a pinched nerve that shoots pain down both his legs. He says an infused topical cream and cannabis gelatin capsules and lozenges are all he needs. JIM LEVY: I have no way to measure, but I'd say it gets rid of 90 percent of the pain. O'NEILL: Levy and the other seniors pay for these products out-of-pocket because Medicare doesn't cover cannabis. 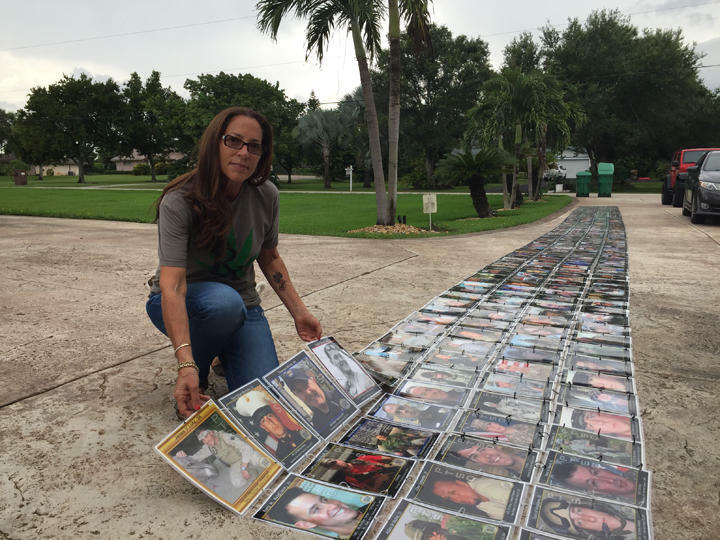 Shirley Avedon paid $90 for a jar of cannabis cream. She says if it helps with that carpal tunnel pain she suffers, it's worth every penny. AVEDON: To me, it's cheap enough. It's better than having surgery. O'NEILL: The next cannabis shuttle is scheduled to roll more seniors to the dispensary tomorrow. For NPR News, I'm Stephanie O'Neill in Orange County, Calif. Transcript provided by NPR, Copyright NPR.